The U.S. Drought Monitor shows that conditions in the summer of 2011 were among the worst on record. View (YouTube movie): Severe Texas Drought – Takes Toll on Rivers - Drying Up! Then use the Texas Water Development Board Drought Information Summary to view Drought Severity for Texas. How do you interpret the cause and effect of having less moisture in the air leading to higher temperatures? Use the Texas Water Development Board Drought Information Summary to view drought severity for each of the regions shown. What does this map tell you about temperature anomalies for Texas in 2005 versus 1950 to 1995? 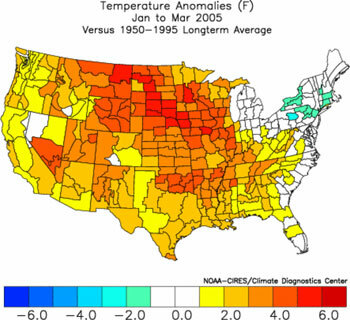 The image shows the three-month average temperature and precipitation anomalies for the United States for the years 1950 - 1995 compared with January to March 2005. Image: NOAA.